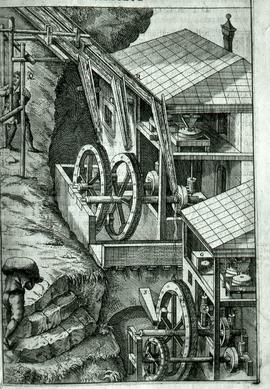 "Zonca 1607, overshot waterwheels (duplicate)"
Vittorio Zonca (1568–1603) was an Italian engineer and writer. He wrote the Theater of machines, which was published in Padua in 1607 four years after his death. The thirteenth photograph features Ispylly mill situated on the River Conway. Unfortunately, Gardner does not give us the county making it difficult to identify the precise geographical location of this specific mill. The sixth photograph features the Wheel of an unidentified mill. This copy of the postcard bears a 1/2d stamp. The postage rate for postcards rose to 1d in 1918, so the image presumably does not date from later than that year. 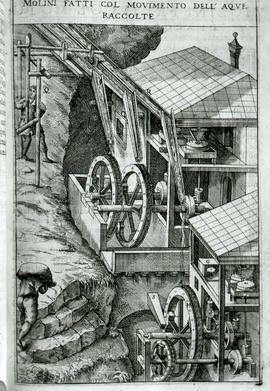 Showing large pitchback metal wheel and wooden launder . Found with five other negatives in an envelope which states that the images were taken near High Wycombe. Architecturally the mill appears to be from the West Country, however. Nancledra, Cornwall (per A A Bryan: Trevellas Coombe Stamps).